I believe that journalism is crucial for democracy just like stories told, for the shaping of a society. One can’t exist without the other. It is more than symbiosis; it is complete dependence. The stories that we tell about ourselves, about what we were, what we are, what we will be (or what we want to be) is our way of existing as an individual and as a collective. As an individual I explain to myself and to others my identity, my relationship with space and time, with reality and dreams. As a society, it is how I relate to others that live partially or completely this same story. Therefore, the narrative of this story, who tells it, who gets involved, what they do, how they do it, is so important. Looking after and thinking about this is essential. Connecting journalism and democracy, since the first newspaper was “invented” (or published), we continue being able to do analysis. Think of a city the size of São Paulo. 96 districts in the city, 38 additional cities making up the greater Metropolitan Area of São Paulo. In total, around 21 million people that live, work, eat, have fun, move around daily share the same geography. In the “media age” that we live in, where almost all communication is mediated and where knowledge is the most expensive matter in decision-making and being able to live better, journalism becomes the common currency. And to move around, these women and men, citizens of a metropolis, need information now more than ever. And to live together, and to not feel different from one another, to see the common good, in order to live in a democracy. Over the last decade, above all, the reduced resources of mass media, the speed of publication demanded by the technological revolution and the growing complexity of the urban context has made the news in São Paulo’s capital (which here is just one example amongst many others), the biggest city of South America, focus increasingly more on the “easy, quick and simple”. In other words, what happens around the editorials of newspapers, magazines and television channels, in worlds very close and known by their journalists, who also live in the immediate surroundings – the “centre”, where the economic and political power of the big urban areas are concentrated. The peripheries – because they are on the edges, on the borders, “distant” geographically – remain outside of the coverage of good quality or were badly represented by stories of violence, by statistics of poverty and other cultural attractions. It made it non-viable, it simplified it, it hid the reality of more than 80% of the population for its own population. We live together therefore, placidly, with the “simple” violence of the constructed narrative by few for much fewer. The violence of exclusion by ignorance (voluntary or involuntary) of many other stories. It is against this that Agência Mural de Jornalismo das Periferias works, from its initial blog format which began in 2010. One of the pillars which guides our daily work is that we don’t believe that we do ghetto journalism. There is not the banner of writing “as periphery” – we reject the geography of exclusion. There is no discourse of “us for us”. We are all equal. The peripheries, in the plural, because they are diverse, they are only peripheries because they were abandoned by the State. Otherwise, only by returning to the example of the city of São Paulo, Campo Lindo would be Vila Mariana. Jardim Damasceno, Santana. Perus, Vila Madalena. In other words, we produce news – narratives – about a determined geographic region, as a correspondent in New York does. Or London. Or Ferraz or Vasconcelos. Or Paraisópolis. What difference does it make? The correspondent of Agência Mural is local. They are a “muralista”. By the way, it is not in vain that we can have a quick pause for reflection and return to the art mural movement funded by Riveras and others: art in everyone’s reach (or the majority), art including all different topics (or not excluding the majority). Everyone used to be muralists. Everyone is a muralist, again. Our name makes me, with happiness, remember the manifesto of the Mexican movement that evoked the right to art at the beginning of the 20th Century. Three principles there are related to Mural today, and I adapt, freely, from the artistic task to the art of journalism: to include the voices that are not heard and share with them the fruits of our work; to believe more in the collaboration than in individual talents in order to foster creation and creativity; and that to inform is as important as participating in the production of the information. Therefore, there is no way of denying, there is, yes, an inevitable engagement, because it is necessary to deconstruct the current preconceptions in the coverage of these excluded “geographical” areas – geography that segregates social class, “races”, genders. 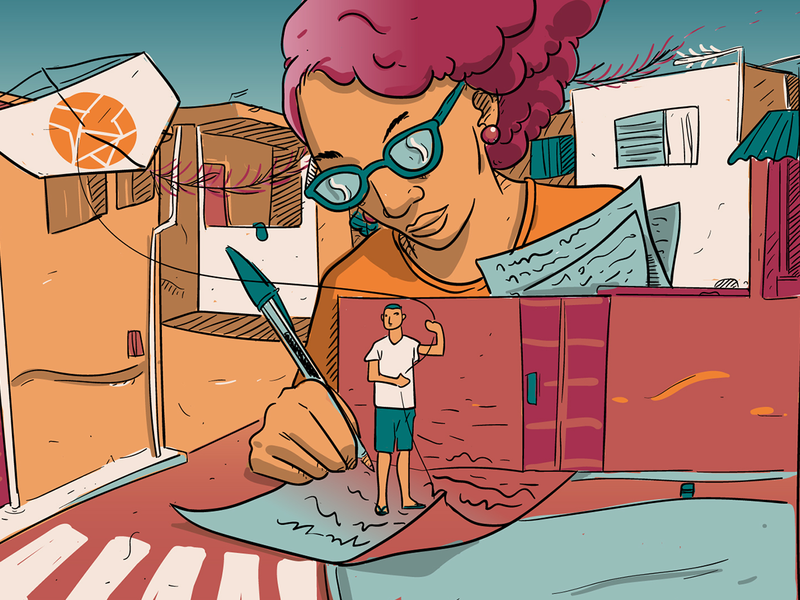 Mural’s coverage produces news that is going to seep into the dominant narrative in order to deny the solidified stereotype over the years: that for the peripheries there only remain two types of stories, those about the violence, or about the “scarcity”. We deny the exotic version of the narrative or, as I say, the zoo of poverty. To be from the periphery is not a trait of the people, it is a state of residence. The muralistas are concerned with covering the reality of their regions. Where other journalists and vehicles don’t arrive. They don’t know how to arrive. They don’t want to arrive. And if those areas are attended less by infrastructure and have fewer employment opportunities, the residents have the right to see its context based on a process of transformation, rather than as an unchangeable plight. To re-engage the reader in order for the information to be useful and in order that, at the same time, the audience participates in its production and circulation. Our stories, therefore, deal with two problems, but also their solutions. The reports about the cultural strength of the peripheries are less accessible to the easy consumption of the gaze “from outside” and, with its complexities, impels the audience to connect. To consume a news article about a music event, the “popular” restaurant, the show of the “rapper” is important, but the worlds remain separate. Therefore, it is important who writes, who the reporter is, which includes all the nuances of the reality of the news. In order to connect sides and end the separation between us and them. But the mission of Mural goes beyond that. We are not satisfied in just telling stories. We want them to be spread. We want everyone to read them. If we make up part of the same huge São Paulo, who are we, if we aren’t us? We need to reintegrate the gaze over the city. We believe that the people that live in the peripheries of the metropolitan region should have the opportunity to see themselves as part of it all. With the work of the agency, they can have access to other visions about where they live. To live in the peripheries begins to be normalized as a geographic position – with all its problems -, but no more as a destination. The reports of the muralistas stress that the outing is not only about valuing the qualities of the peripheries nor running away from them. The true solution is to transform them, to bring the peripheries into the centre of attention, the focus of development, in new centres of the city. Therefore, we do other actions of journalism that are related to its distribution, that is to say, our audience, the citizens of this huge metropolitan area. In the digital age, we opt for not neglecting the “live”, when we occupy a space in a cultural event in the peripheries in order to show our reports to the residents and to encourage the direct contact with the local correspondents. If a vehicle is not relevant for its audience, it will die. In times of crisis in the journalism industry, we believe that to engage the reader is not only (as if that were not enough) a matter of believing that to keep a free and active press is the fundamental condition in order to contribute to the growth of democracy. Today it is a matter of survival.